This year, I am teaching a grade 2/3 split. I have had some of these munchkins since Kindergarten (with a year mat leave in-between). Needless to say, we didn't need much time to go over procedures and classroom norms because I have had many of these children for 3 years. I am team teaching math with 2 other teachers, so for math I teach all of the second graders. My school board uses the math program, "Math Makes Sense" and for the most part I really like the program except for all of the worksheets to photocopy. Now, if you know me at all, I try to use the iPads A LOT during math. Why photocopy a worksheet when you can use manipulatives and the camera on the iPad? 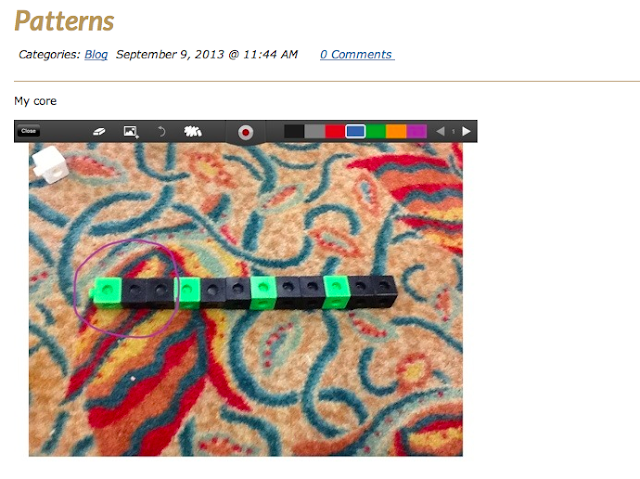 Not to mention the ability to annotate and capture students talking about their thinking. 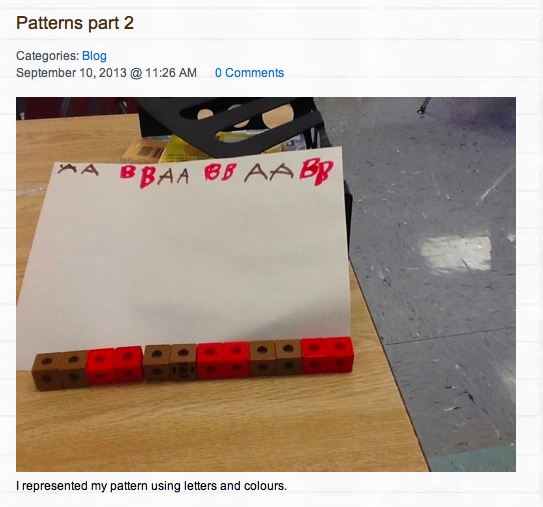 The second learning goal was to be able represent a pattern in different ways. After the lesson. I again instructed the students to get out the iPads, manipulatives, paper, markers and whatever else they wanted that would help them to answer the problem prompt. 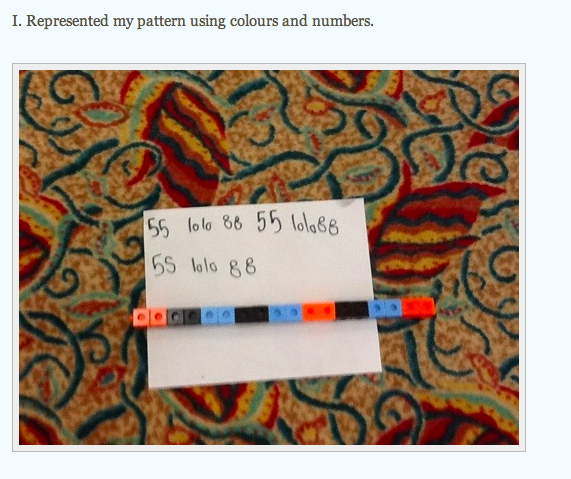 Create a pattern using three colours of snap cubes. 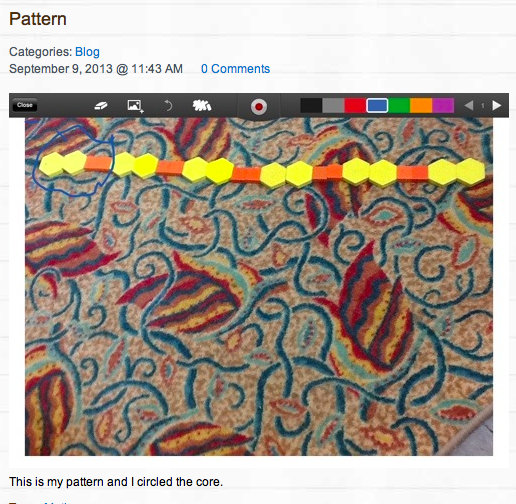 Find another way you can represent your pattern. I also had 2 students create videos and use sound (clapping, snapping and stomping) I would love to show you, however the video is at school on the iPads, so you will have to take my word for it until I can upload the video to my blog. The final learning goal for this unit was to Use "look for a pattern" to solve a problem. After the mini lesson (different problem solving strategies and how to make a plan to solve a problem), I put children into groups of three and gave them the problem prompt. There are 9 red beads, 3 green beads, and 6 blue beads. Make a pattern using all the beads. I had students use any type of manipulative they wanted and they got right to work. Some drew pictures but most got manipulatives. I was pleasantly surprised how many groups got it without much prompting. I did have one group that I worked through the problem with. The following day we did a similar problem with different amounts of beads and only one munchkin was still having trouble. I did not use one single photocopy or worksheet for this unit. My students choose how to demonstrate their learning and I have evidence of all of their work on their blogs for assessment. Best of all, all of my students were successful with this unit. Is it because I gave them choice? Is it because they weren't sitting at their seats doing worksheet after worksheet? Is it because I am able to give small group instruction while the other children are busy showing their learning on the iPads or any other way they choose? I think the answer is yes to all of the above questions. I still covered the curriculum, I still delivered math mini lessons and I still have a group of students that are excited when I say that it is math time! Wow! That is just what we are doing in our class. I to am teaching a Grade 2/3 class. I have developed 4 math stations - a Learning Lab (which is a teaching lesson led by me), a playground practice where students use manipulatives and iPads to show what they know, a Journal Junction - which is a paper copy of what they know - worksheet type activity and Game Garage which is a station where they can play the math games we have learned that reinforce concepts - each group will do one station a day - 4 day rotation - I have grouped my students into 4 groups - 2 grade 3 groups and 2 grade 2 groups! Right now we are just learning how to do each station.